Here are just a few Dog Training FAQ that we have been asked over time. Have a question? Feel free to to fill out the contact form. Why do I need a certified dog trainer? Certified professional trainers have received the proper formal education needed to understand and successfully train your dog. A certified trainer has studied canine behavior and a variety of different methods, and has been tested on this knowledge. This education paired with real world training experience, allows them to create the perfect training program for your pet. Call (631) 241-6482 to schedule a free evaluation with one of our Long Island, NY based, certified dog trainers today! To begin, each lesson is conducted in your home. As your dog advances, lessons can be held at a pet store or location with higher distractions. Lessons runs 50 minutes to one hour and are scheduled on a weekly basis. Each week we focus on something new for your dog to learn which builds on the skills learned the previous week. Lesson times are available starting at 10 am to our last lesson offering at 8 pm. Why private in home lessons as opposed to group classes? In home training gives your dog the advantage of learning new behaviors in a low distraction environment, and then building up to higher distraction environments. Learning a new behavior in a group class setting is very difficult because of the other dogs, noise, people and many other distractions going on. Working with your dog in your home also allows us to deal with every day behaviors and manners, such as, greeting people at the door, respecting everyone in the family and learning boundaries. At what age can I begin training my puppy? At Sublime K9, our trainers are puppy specialists. Our methods can be used on puppies as young as 8 weeks of age! The sooner you begin, the better. Beginning early allows for the prevention of so many issues including separation anxiety, aggression, running away and overall not listening. Start off on the right paw with your dog and begin bonding immediately. Visit our Services page for more details about our puppy preschool program. No, most of the time people think if their dog is 5 years old, they are too old to be trained. That is not true. It really depends on the breed, the issues being addressed, and the overall health of the dog to decide if the dog is too old for training. Most of the time the answer to this questions is no. I just want my dog to listen, I don’t care if he/she can sit and stay. Why do I need formal dog obedience training? Formal obedience training is the answer to preventing, correcting and modifying most unwanted behaviors. You must establish yourself as the pack leader so that your relationship can flourish. In order to do this, there must be a clear way for you to communicate with your dog that both you and your dog understand. Formal obedience training develops this communication and gives both you and your dog the tools needed to have a lifelong, healthy bond. We do not have one particular method that we use. Our trainers have studied many different methods and will meet with you at the free, in home evaluation to decide what methods will work best for your particular situation. You must feel 100% comfortable with the method of training chosen. How many lessons will my dog need? 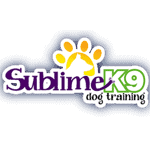 Sublime K9 offers a free evaluation so that the trainer can meet with you and your dog and get an understanding of the dogs temperament as well as what your goals are. The quantity of lessons varies case by case depending on how many dogs and the issues being addressed. The typical range is from 5-10 lessons. What if my dog needs more lessons than the trainer estimated? Although this rarely happens, your trainer does not disappear after your lessons are complete! We are available via text, Facebook, email and via phone. Additional lessons can also be scheduled on an as needed basis. Cash, credit cards and checks.